People are fascinated with something rare and exotic. And one of gems that catches the interest of people is the yellow diamond. Because there is a sense with newness and rarity, yellow diamonds are still relatively novel for most people. What makes a fancy yellow diamond rare? The common answer from most of people is how large, clean and colorless the diamond is. This is only partially true. In nature, diamonds are found in nearly every color and some colored stones are far rarer and sought after than colorless stones. Fancy yellow diamond are rare as they are and have been gaining popularity and are gradually becoming more and more available in the jewelry trade. The depth of colour on “Fancy Intense Yellow” is hard to beat in any other stone and cannot be mistaken for other lesser yellows like lemon yellow or just fancy yellow. The most important factor in evaluating a fancy yellow diamond is the richness and beauty of the colour. The very colour of fancy yellow coloured diamonds also makes them more complicated to cut properly. Fancy coloured diamonds have their own demands for the diamond cutter. The cutter must endeavour to cut the diamond to assist light entering to produce the most intense display colour. Mike Nekta Engagement Rings & Bridal Jewelery carries a fine collection of beautiful and rare fancy yellow diamond engagement rings and fancy yellow diamond earrings and bridal jewelry. 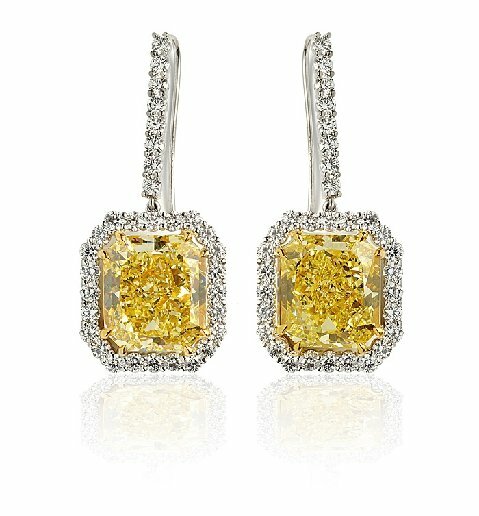 And one of the favorite collections is the Radiant rectangle matching pair of earrings that is certified Fancy intense yellow – a very vibrant yellow color in Clarity grading of VS2 in 10.24 carat and Clarity grading of VS1 in 10.91 carat weight with an exceptional cut that is so rich and beautiful. An extremely deep and vibrant fancy intense yellow color and practically flawless!